﻿is direct-mailed to homeowners in around the Montclair area, as well as local businesses. Additional copies of the magazine are distributed through high-traffic locations. 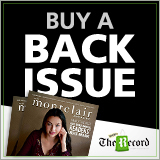 Montclair Magazine is the exclusive publication for Montclair and surrounding communities and the only one with 100% local editorial. Each issue showcases the people, places and events that make the area special.